The cassette seals consist of a Simmerring Oil Seal and an unlosable, integrated running surface. Thanks to the rational system solution with an integrated labyrinth, the complete unit provides high protection against impurities. In addition, the combination seals are particularly suitable for use with strong loads. In the process, the integrated running surface meets the special requirements placed on a dynamic seal. 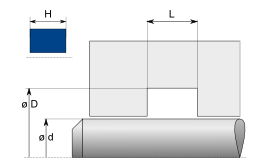 Additional advantage: The cassette and combination seals of Freudenberg Sealing Technologies are flexible, allowing axial and rotary movements.